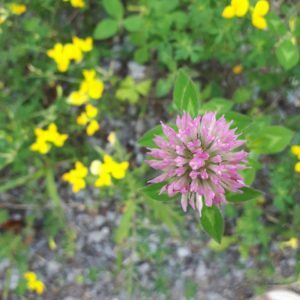 Red Clover is blooming prolifically on our land and elsewhere at this time of year. Not only are they pretty, they are one of the wild plants that offer us much nourishment. On my walks, I gather the flowers and dry them on a rack for a few days. Once they are completely dry, I store them in a jar in the pantry. I learned about making herbal infusion from Susun Weed when I did my coop with her back in 2000. If you’d like to learn more about making infusions, she offers an affordable online course here. Red clover flowers a good source of B complex, vitamin C, calcium and magnesium; highly nourishing. It is a calming reliever of many distresses such as sore joints, anxiety, constipation and energy loss. Infusions extract more nutrients and medicinal qualities from herbs than teas. To make a red clover infusion, add 1 litre of boiling water to 30 g (about 1 cup) of dried clover flowes in a jar or pot with a tight lid. Set aside to infuse for 3 hours. Strain and store in the fridge. Infusions can be served hot, chilled or at room temperature and sweetened or flavoured according to taste. Consume them within 36 hours. Note: red clover may contribute to blood thinning if improperly harvested, dried or handled.